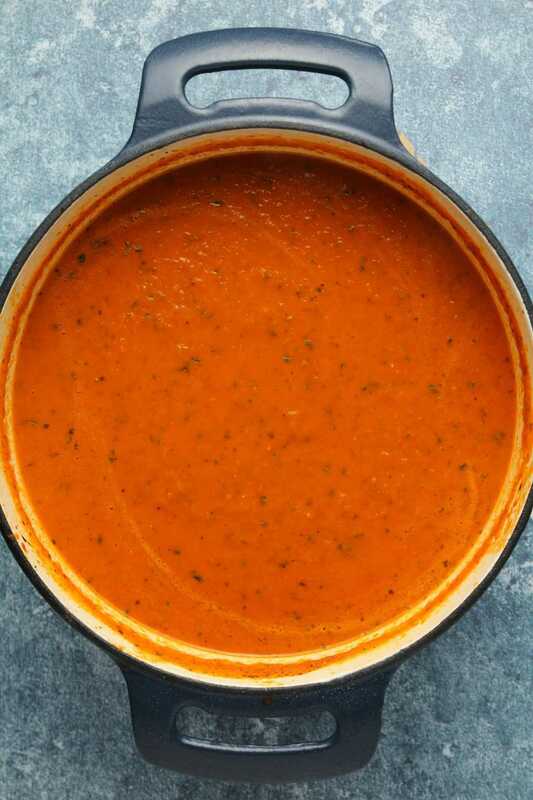 This vegan tomato basil soup is so good I could eat gallons of it. 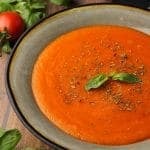 Seriously, even though consuming too much tomato stuff has the possibility of giving me heartburn I am so willing to take the risk for this soup! It’s that good. 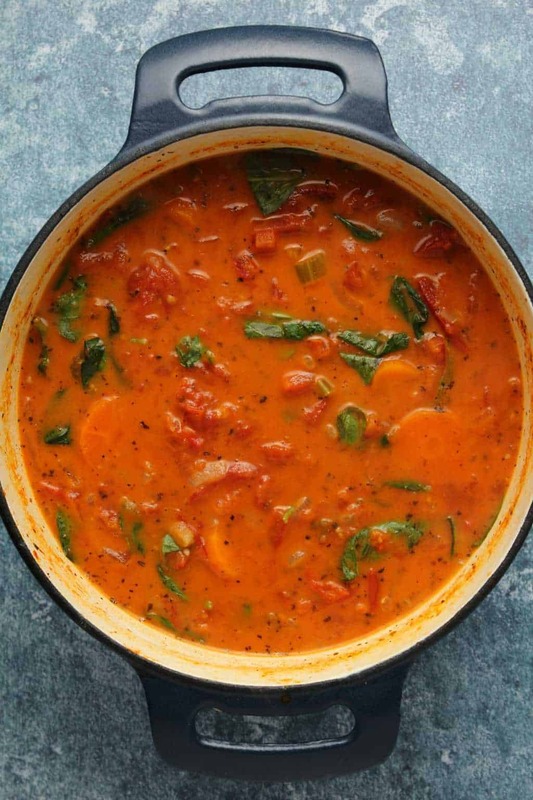 It’s creamy and rich and has all the tomato flavor you could dream of combined with the flavors of deliciously fresh basil. 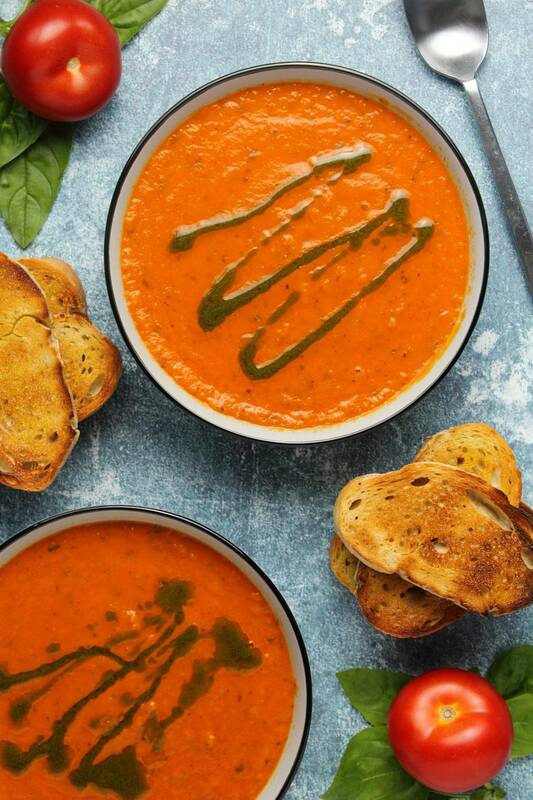 This is not our first time making a vegan tomato soup, but this tomato basil combo is next level delicious. 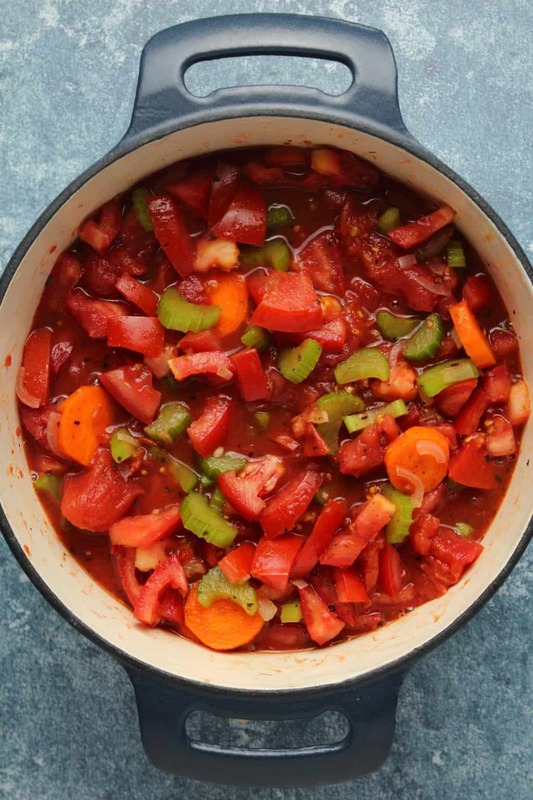 We used canned tomatoes as well as fresh tomatoes in this soup as well as some carrots and celery and cooked it all up with some onions, garlic, spices and vegetable stock. 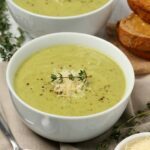 Fresh basil and coconut cream are added in at the end and then blended up into a smooth and fabulous soup. The basil just barely wilts in the soup and then is blended in with an immersion blender. This keeps the basil flavor deliciously fresh. 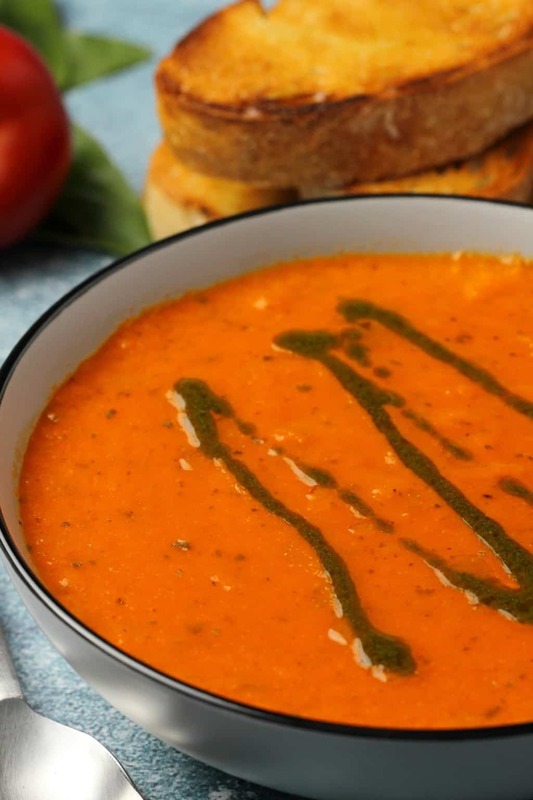 For serving drizzle on a little homemade basil oil and serve the soup along with some bread for dipping and everyone will be thrilled with you. Homemade basil oil is super easy to make, you just crush up some basil leaves into a paste with a mortar and pestle and then add in some olive oil. If it’s looking like it wants to separate even after whisking together then give it a quick whizz with your immersion blender (just a quick one, you aren’t trying to emulsify it). You want the oil to be nice and green and full of flavor. 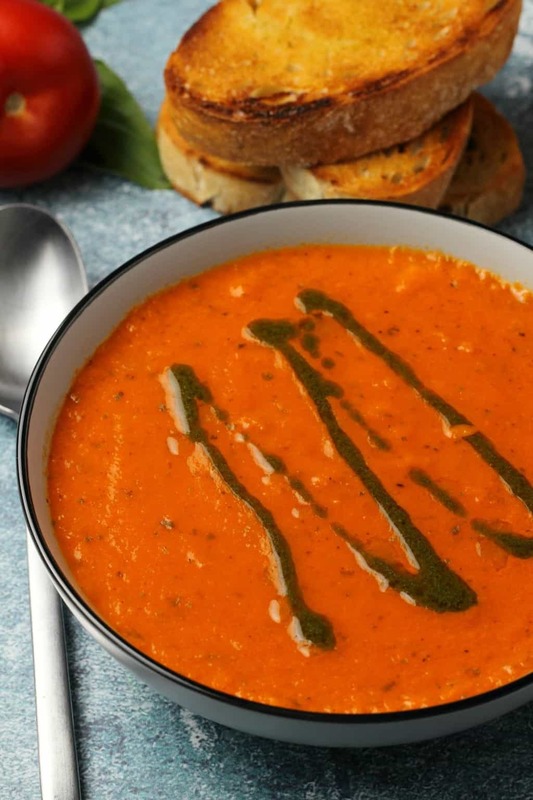 It makes this tomato basil soup look totally restaurant-worthy! 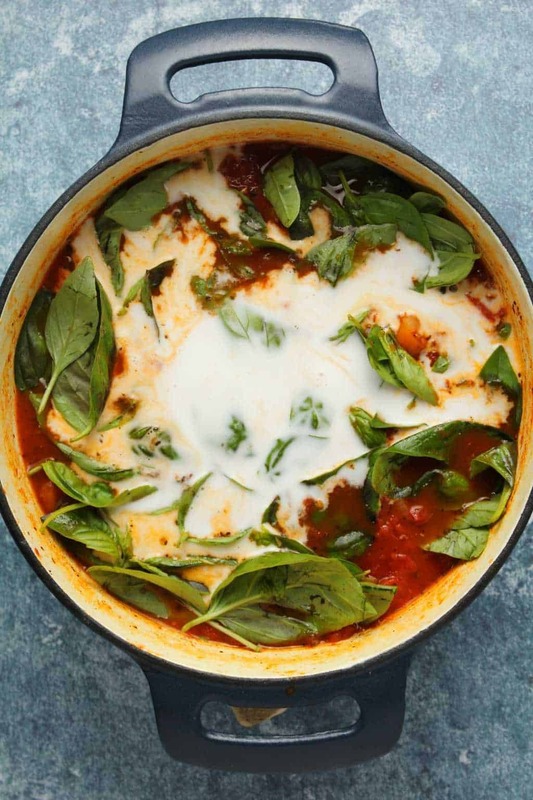 The basil oil was a little tip I picked up from Jamie Oliver, and it’s really well worth making just to drizzle on top of this soup. 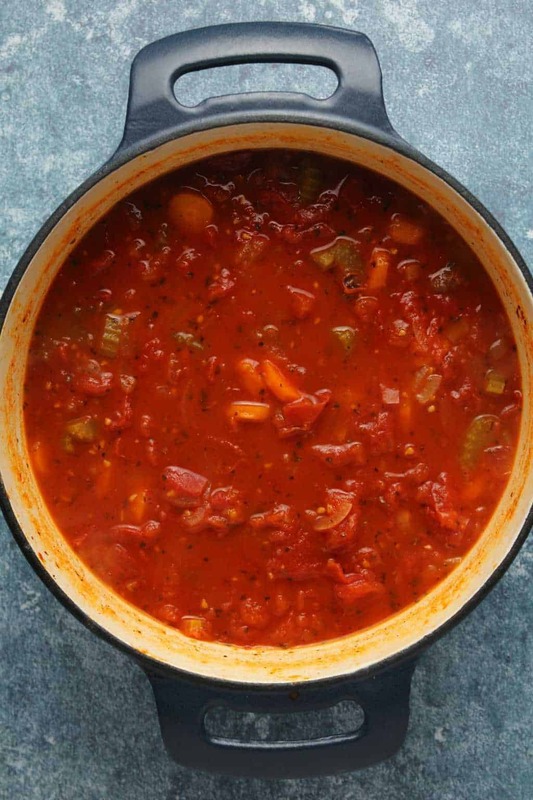 It’s entirely optional of course and not actually part of the soup recipe itself, but I do recommend you give it a go! 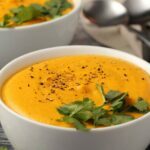 I’ve mentioned an immersion blender a couple of times already, and if you don’t have one, you can absolutely use a regular blender for this soup. Just transfer it in stages to your blender jug and then transfer in stages back to your pot. It is a bit more effort though to do it like that and an immersion blender is a super useful kitchen tool to have. You can use it to blend your soup directly in the pot, and to make your own vegan mayo and all sorts of cool things! So I recommend you get one if possible, they are really inexpensive too. You can get an immersion blender from Amazon. 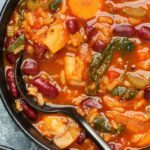 Leftovers keep very well and can be reheated the next day! 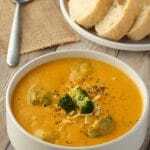 This soup would go fabulously well with some homemade whole wheat bread for dipping! Or with some delicious vegan dinner rolls or even some vegan cornbread! Or any delicious bread for that matter. We just went with some toasted ciabatta which was delicious. 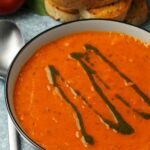 So what do you think of this vegan tomato basil soup? 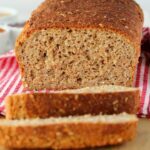 Let us know in the comments and please rate the recipe too! Thank you! 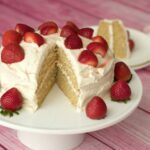 Sign up to our email list before you go, you’ll get a fabulous (and free) recipe ebook containing 10 delicious vegan dinner recipes and you’ll be the first to know when new recipes are posted to the blog. 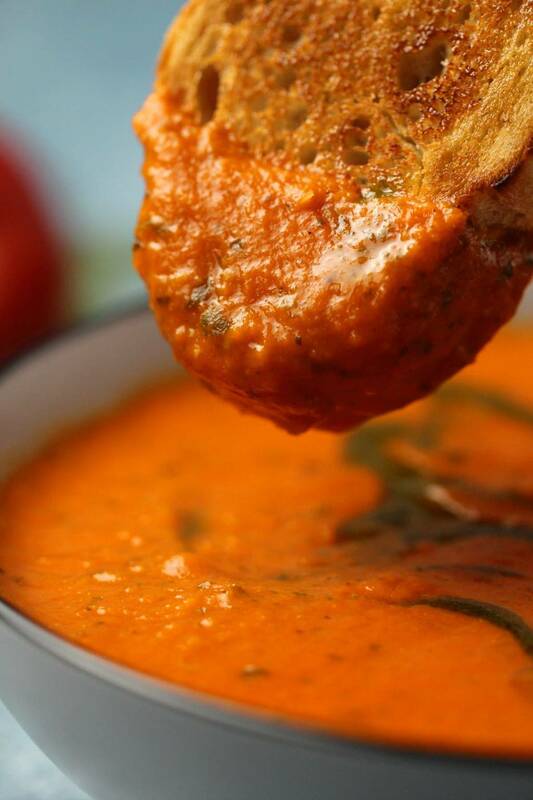 Deliciously creamy vegan tomato basil soup served with a drizzle of homemade basil oil. Super easy, restaurant-worthy appetizer, packed with flavor! Add the olive oil, onion and garlic to a pot and sauté until softened. 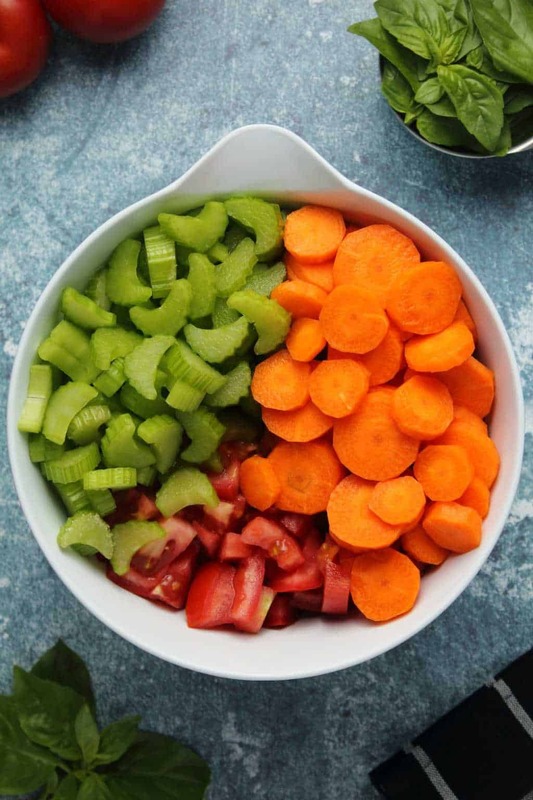 Then add the oregano, dried basil, carrots, celery, canned tomatoes and fresh tomatoes and mix together. Then add in the vegetable stock and bring to the boil. Turn down the heat, cover the pot and leave to simmer until the carrots are softened. Remove from the heat and stir in the sugar, fresh basil and coconut cream. 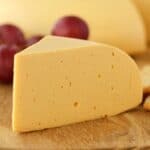 Blend with an immersion blender or by transferring to your blender jug in stages and then returning to the pot. Add salt and pepper to taste. To make the basil oil crush basil leaves with a mortar and pestle until you have a paste. Then mix with olive oil and whisk together. If it isn’t mixing together well and is separating you can use the immersion blender quickly to blend it together nicely. 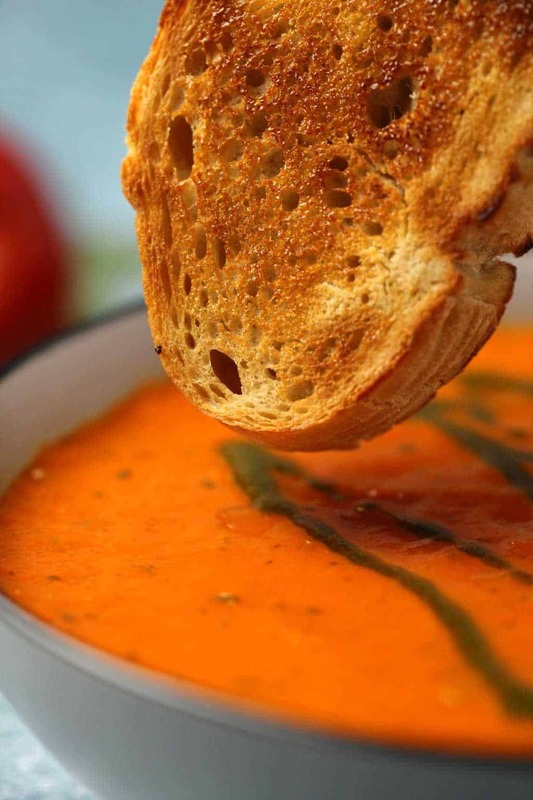 Serve the soup with a drizzle of basil oil and some crusty bread for dipping (optional). 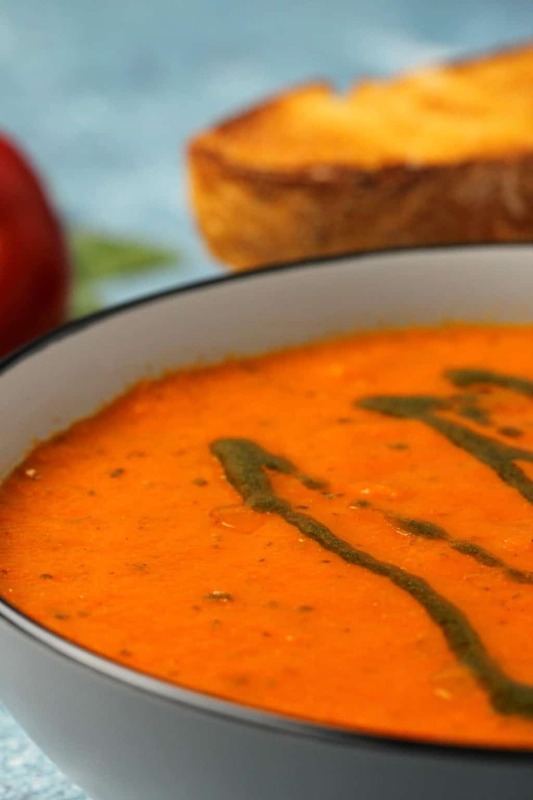 *Nutritional information does not include anything the soup is served with such as basil oil or bread. 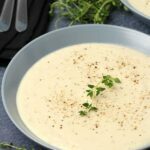 I’m not a fan of creamed soups but the picture of this one before you add the cream and blended it looked fantastic! How do you think it would taste at that point? would you add something else? maybe just the basil and let it cook in or would that be too much without the cream? perhaps some spinach? 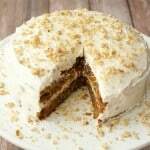 Would it work to add a can of full fat coconut milk instead of coconut cream? I imagine it would just make the soup a bit thinner. Thank you!